You are currently browsing articles tagged John Ewing. In his sermon on Psalm 119:136, Thomas Manton concludes this doctrine from the text, “That it is the duty and property of a godly man to mourn bitterly, even for other men’s sins.” I dare say the times now demand such prayer. More than ever, this old doctrine of the Scripture must be revived and returned to practice. It is a duty resting upon all Christians, Manton says. God calls His people to grieve over the sins of those around them. Our prayers must be so focused and intentional. There is more here than can be unfolded in short order, so with your indulgence, I present you with a reading list. You may have some of these works in your own library. If not, many are readily available on the Internet with a little searching. All are well worth your time to read, though the sermons by Thomas Manton are among the clearest in pressing home this vital doctrine. Adams, Thomas, on the text of 2 Peter 2:7-10 in his commentary on 2 Peter. Bridge, William, “Comfort to Mourners for the Loss of Solemn Assemblies,” Sermon 7 of “Seasonable Truths in Evil Times,” Works, 3. 407-426. Bunyan, John, The Excellency of a Broken Heart, esp. pp. 42-43, 76. Burroughs, Jeremiah, Gospel Fear (SDG, 1992), pp. 75-166, on 2 Kings 22:19. Burroughs, Jeremiah, Sermons VI-XI, The Saints Happiness. Ligonier, PA: SDG, 1992, pp. 36-74. Henry, Matthew, see his comments on Jer. 13:17; Ezek. 9:4; and 2 Peter 2:7-8. Howe, John, “The Redeemer’s Tears Wept Over Lost Souls,” in Works, pp. 316-389. Jenkin, William, “How Ought We to Bewail the Sins of the Places Where We Live?,” in The Morning Exercises at Cripplegate [aka Puritan Sermons], vol. 3, pp. 110-128. Kitchen, John, “How Must We Reprove, That We May Not Partake of Other Men’s Sins?,” in The Morning Exercises at Cripplegate [aka Puritan Sermons], vol. 1, pp. 121-142. Lloyd-Jones, D. Martyn, “Blessed Are They That Mourn,” in Studies in the Sermon on the Mount, vol. 1, pp. 53-62. Manton, Thomas, on 2 Peter 2:8, Works, pp. 183-184 and 423-426. *Manton, Thomas, on Psalm 119:137, Vol. 3 of the 1990 Banner of Truth reprint set, pp. 139-154. McCrie, Thomas, “Sermon on Psalm 119:136: Grief for the Sins of Men” in Naphtali Press Anthology, 2.2: 42-47. Roberts, Maurice, “The Remembrance of Old Sins,” in The Banner of Truth, October 1994, pp. 1-5. Sibbes, Richard, “The Art of Mourning,” in Josiah’s Reformation, Works, vol. 6, pp. 59-75. ____________ , “Spiritual Mourning, Works, vol. 6, pp. 265-292. Spurgeon, Charles H., Metropolitan Tabernacle Pulpit, vol. 51, pp. 485b-486. Watson, Thomas, The Godly Man’s Picture (Banner of Truth, 1992), pp. 55-60; 77-96; etc. Welsh, John, Sermons on Repentance, in Naphtali Press Anthology, vol. 1, no. 3, pp. 33-49 and 1.4, pp. 42-55. Williams, Daniel, “What Repentance of National Sins Doth God Require, as ever we expect National Mercies?” in The Morning Exercises at Cripplegate [aka Puritan Sermons], vol. 4, pp. 585-616. The following is Dr. Samuel Miller’s reply to William Buell Sprague’s request for a biographical account of the Rev. Dr. John Ewing, who had long served as the Provost of the University of Pennsylvania. But the narrative which Dr. Ewing, after his return to America, was wont to give with most graphic interest, was that of his first interview with the celebrated Dr. [Samuel] Johnson, at the table of Mr. Dilly, the wealthy and hospitable Bookseller of London. Dr. Johnson, it is well known, was violent against the Colonies; had written a popular pamphlet against their claims [The Patriot, (1774)] ; and heaped upon them and their advocates the coarsest abuse. Mr. Dilly, in inviting Dr. Ewing to dinner, apprized him that Dr. Johnson was to be of the party, and cautioned him against contradicting or opposing the great literary despot. During the dinner the contest with America became the subject of animated conversation. 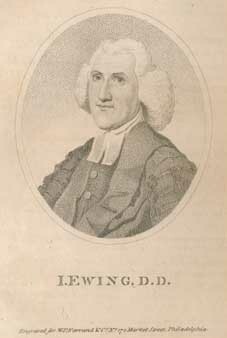 Dr. Ewing, the only American present, being appealed to, began, with his usual frankness, to defend the Colonies. Dr. Johnson, looking at him with sternness, said, “What doyou know, Sir, on that subject?” Dr. Ewing calmly replied that, having resided in America all his life, he thought himself qualified to form and to express opinions on the situation and claims of the country. Dr. Johnson’s feelings were roused. The epithets of rebels and scoundrels were pretty liberally applied to the population of the Colonies. At length Johnson rudely said, “Sir, what do you know in America? You never read. You have no books there.” “Pardon me, Sir,” replied Dr. Ewing, “we have read the Rambler.” [a periodical published by Dr. Johnson, 1750-1752]. This civility instantly pacified him; and, after the rest of the company had retired, he sat with Dr. Ewing until midnight, in amiable, eloquent, and highly interesting conversation.